Unlike in the past, there are many different types and brand of oil filters available for cars. These little devices keep the engine oil clean and free of contaminants. While these work similarly, not all oil filters are designed the same. In simple terms, when it comes to car oil filters, consumers get what they pay for. Because it can be rather perplexing to find the right oil filter for your car, we went ahead and reviewed the best oil filters on the market specifically designed for cars. You can save time browsing for the best oil filter now. Scroll down to read our reviews and a useful buyer’s guide to choose the oil filter that best suits your needs. The oil filter in a typical car circulates engine oil through small holes. While it does so, it removes various contaminants in oil like carbon particles and dust. Cleaning out the oil in this manner protects the engine from damage. Compatibility—Before you consider anything else, you must consider the compatibility of the oil filter. The filter must be able to fit in the exact make and model of your car’s engine. Check with the filter manufacturer, who should provide a list or a table of compatible vehicle models and engines and make sure your vehicle is on this list. Oil Type—Oil filters have media inside that takes care of the filtration of the oil. This media is not made equally for synthetic and conventional oil. Therefore, you must check whether the oil filter is compatible with the type of engine oil in your car. This information is easy to find on the label or the online product description. Mileage—Oil filters should be replaced or cleaned out following a certain mileage level. Most oil filters are designed to last up to 5,000 miles. High-performance oil filters can last from 6,000 to 20,000 miles. You might want to consider this mileage level when buying an oil filter because you will have to be vigilant about when to replace or change it. Check the price only after considering all of the above. You can find more information about choosing an oil filter in the buyer’s guide at the bottom. Why we like it: Top quality design, affordable price, and incredibly high-efficiency levels—what’s not to like? Undoubtedly, the Motorcraft FL820S oil filter is one of the best available in the market right now. These oil filters are made for Ford vehicles, but other compatible engines can also use it. 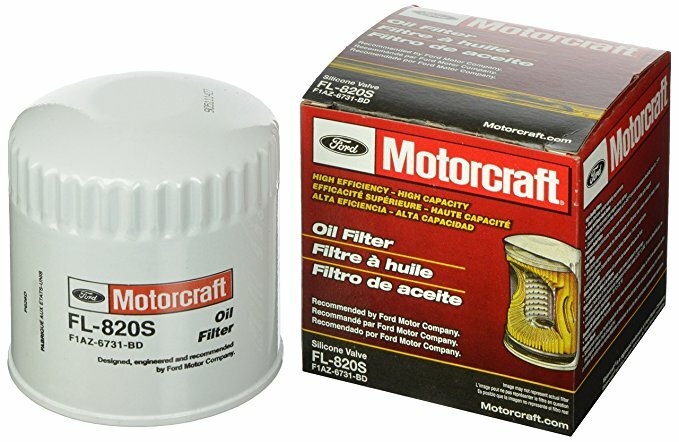 Motorcraft filters are made by Purolator but are widely considered to be actually better than Purolator-branded products. What really makes these oil filters stand out from the rest is the design of the anti-drain back valves (also called pressure relief valves). The back valves are smartly positioned to prevent dirty oil from re-entering the engine. Other oil filters are not designed in this way, so Motorcraft really stands out. The back valves are also designed to maintain a steady supply of oil to the engine even when it’s really cold. If the filter gets clogged, the back valve would continue to supply the engine with oil. When the engine is not running, the valve would prevent the oil from draining out of the filter. The valves are made of silicone, which is highly durable and doesn’t age like other parts of the engine. It can also resist the high-temperature conditions inside the engine. The outer case is made from ironed steel, which fits precisely and is coated to resist rust and corrosion. This Motorcraft oil filter is incredibly efficient. It boasts over 95 percent of efficiency levels when screening for debris like sand, carbon particles, dust, and tiny metal bits. The design of the valve and the filter prevents any type of contamination. This oil filter by design has a better capacity to collect and trap contaminants that would otherwise harm the engine. It works perfectly well with conventional and blended oils, but not so much with synthetic oils. The oil filter is long lasting, and can only need to be changed every 5,000 or so miles. We were very impressed by this oil filter. It’s truly remarkable in its anti-drain back valve design. It really delivers what car owners want, which is to not just filter contaminants from oil but also to prevent the recirculation of contaminants. Why we like it: An excellent oil filter well-suited for engines that use synthetic oils. 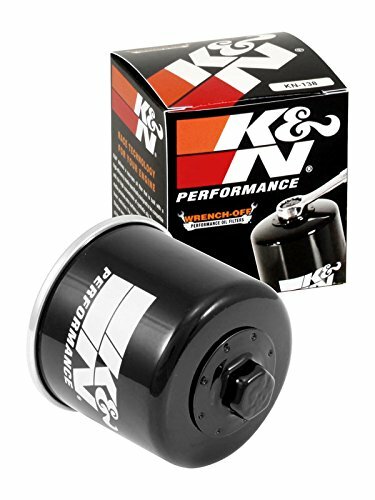 K&N Powersports is the best oil filter for cars that use synthetic engine oils, in our opinion. 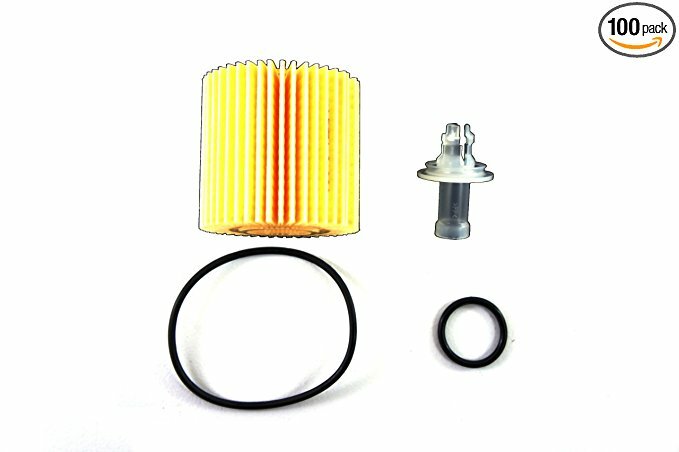 This filter is suitable for use with motorbikes and ATVs as well. The high-performance spin-on filter is well-suited for worn out engines in need of a good filtering. The Powersports oil filter is designed to let pressure drop without hindering the filtering process. Each spin-on filter is encased inside a heavy-duty metal can. The can protects the filter from extreme conditions like freezing weather. The can is outfitted with a 17mm exposed nut. The nut is at the end of the filter to make installation easy. The filter has resin inside for effective filtration of contaminants. This filter does have an anti-drainback valve to prevent contaminated oil from draining back into the engine when it is shut off. However, it doesn’t have the capabilities of the Motorsports no-drain valve. This oil filter is intended for use in synthetic oil engines. The manufacturer boasts a 99 percent effectiveness in removing contaminants from the oil. Indeed, we have yet to find a better filter for synthetic oil. Because of the nut, the overall length of the filter is longer. That can make it difficult to get past the exhaust system in most cars. Installation is easy, but it really needs to get to a cramped area. The nut makes it much easier to remove the filter whenever needed. Other than that, this filter works as intended. It’s particularly good with older engines, especially those that have run for more than 100,000 miles. This is a superb oil filter that works just like an OEM product. There are really no significant cons that would affect purchases. It is a bit expensive compared to even some OEM products, but the price is well- worth it. The filter is very effective at filtering out contaminants and keeping them out of engines. We highly recommend this for engines reliant on synthetic oils. Why we like it: The Mobil 1 M1-110 has a high passer rating and an additional capacity compared to other filters available in the market. Mobil 1 M1-110 is one of the best-known premium oil filters for newer car models with modern engines. These filters are not cheap, but are well worth it when the interval for changing oil filters are long. This oil filter is best suited for vehicles that use premium or unconventional oil. This oil filter is designed for modern engines with longer drain intervals. The filters are made to be highly durable so car owners don’t have to change the filters every 5,000 or so miles. The Mobil 1 M1-110 is highly effective—it has a 99.6 percent multi-pass efficiency rating. The filter has an advanced synthetic fiber blend media to remove contaminants in the most effective manner possible. Compared to other oil filters, this one can hold extra 28g of capacity. The oil filter technically has a silicone anti-drain back valve, but it’s only available if the OEM requires it. The valve, when present, can prevent dry starts and eliminate internal leakage from the engine. The biggest advantage this oil filter has is that it is very long-lasting. The filters can last in a car for 7,000 miles or even more. We never experienced any issues, possibly because of the additional capacity to hold contaminants. 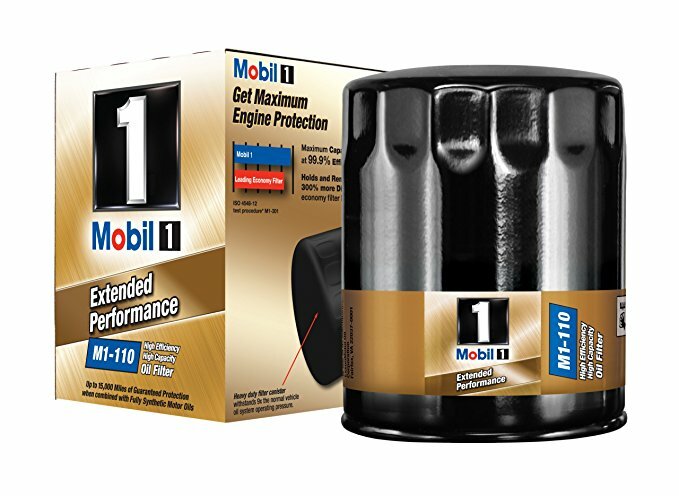 Another massive advantage of the Mobil 1 M1-110 is that it can withstand system pressure up to 9 times more compared to similar oil filters for cars. The filter provides anti-contamination protection up to an impressive 615 pascals! The oil filters are very well built. The drawback would have to be the expensive price tag. While these filters are indeed expensive, the perks are well worth the price. If you have an expensive car engine, these filters would definitely be worth the money. We feel like we don’t need to go back to buying cheap oil filters with this. The Mobil 1 M1-110 oil filters are highly effective, long-lasting, and can withstand pressure conditions most other filters can’t. You will have to be willing to spend some extra cash on one of these filters. But each is well worth the price, in our opinion. Why we like it: This is an OEM oil filter, so it is one of the best available on the market. If your car is a Toyota, then hands down this would be the best oil filter. This is a genuine OEM oil filter for Toyota models, so it should directly fit in the cars. If the manual for your Toyota recommends OEM parts, then this oil filter should be the best auto part you can buy. There should not be any issues with this oil filter in a Toyota vehicle. This oil filter is the real deal and it’s perfectly designed to remove contaminants in Toyota engines. It comes recommended to be used with Toyota branded air filters as well. However, you can use this oil filter with other brands of air filters if needed. The Toyota air filters stand out because of the really high-quality O-Rings in them. It’s much better compared to even the best aftermarket brands. Plus, the filter is highly affordable, despite being an OEM part. The O-Ring is made in such a way that it always retains its form. It will remain intact even during installation. That means the installer doesn’t have to worry about accidental leaks. We only experienced a top-notch performance from this oil filter, as expected from a genuine Toyota product. It was a perfect fit for the test Toyotas we had. Installation was really easy too. Some O-Rings in the aftermarket, and even OEM, oil filters can twist when being installed. But not this one. Most likely due to the high-quality material it’s made from, the O-Ring didn’t kink during installation and remained in place. Because this is an OEM part, it takes a lot of guesswork out of the process of buying an oil filter. 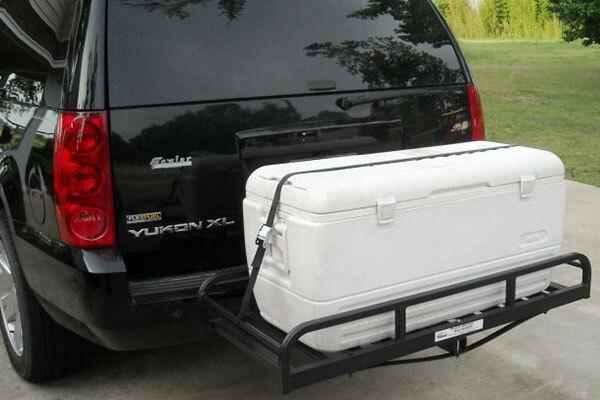 Buyers don’t have to worry about whether this part would fit their Toyota. However, these oil filters are not as widely available as they should be. The filter is very decent but the drain mechanism isn’t fault-free. The valve system can make the oil spill all over. We didn’t notice any issues following installation though. This OEM oil filter is wonderfully affordable considering the high-quality material in it. It has a great O-Ring that doesn’t break or get bent. The filter is lon- lasting as well. Why we like it: An aftermarket BMW oil filter that looks and acts a lot like the OEM product. These oil filters are intended for BMWs. 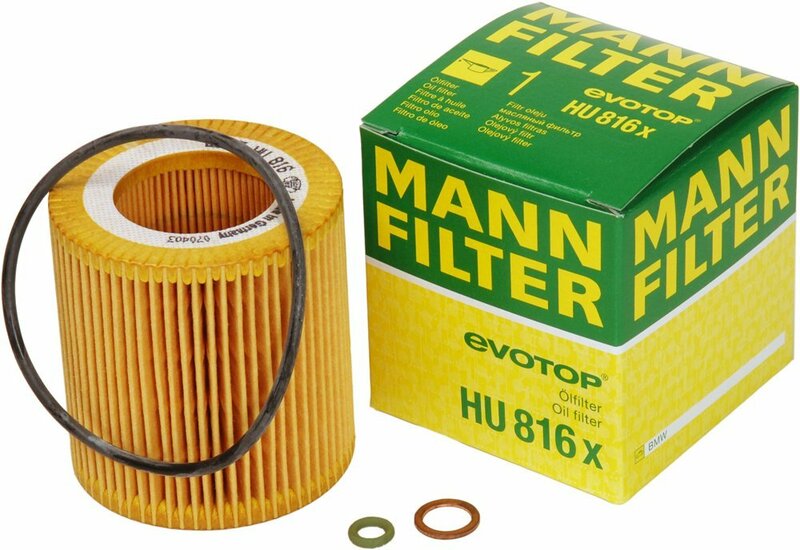 In fact, the Mann filter looks and performs identically to the BMW OEM oil filter. If you own a BMW or a similar SUV, this oil filter would most likely be a perfect fit. The design of this oil filter is not much different from the original OEM part for BMW. The oil filter is sold with O-Rings that are made from hard plastic only. If your car engine has a specific requirement for metal-free oil filters, then this should fit in perfectly. There is no corrosion issue of course. Then again, most oil filters don’t have corrosion issues. The oil filter is rather standard, but it performs considerably well on par with the genuine OE. The filter is highly efficient. It has an immense contaminant bonding capacity largely thanks to the higher surface area available on the filter. The oil filter sports a pleated structuring. So the surface area of the filter is naturally larger. This is a great feature, but by no means unique to this brand. We found the oil filter easy enough to install. With a wrench removal tool, the installation would be quite easy. Thanks to the filter’s large surface area, it has a high holding capability. The filter doesn’t require that many changes in between. It only needs changing every 10,000 miles or so. Our only gripe is the price. This oil filter can be difficult to find and can be expensive when available. We were really impressed by the performance of this oil filter. Though an aftermarket product, it can function reliably like an OEM product. We’d say it’s well worth the price. Why we like it: Specially designed to be easy to install and remove, The Fram oil filter is worth every penny. This oil filter can decontaminate the engine up to 5,000 miles. While it’s not as long-lasting as some other oil filters on this list, the FRAM PH7317 has many other perks that justify the price. This oil filter is best used with conventional oil. It might not suit some modern engines that rely on synthetic oil. But this filter should suit most cars. The Fram oil filter boasts a contaminant-trapping efficiency level of some 95 percent. That’s quite impressive for an affordable, conventional oil filter. It’s great for removing contaminants, and also comes with a larger than average capacity for holding dirt. What we found really special about this oil filter is its coating. 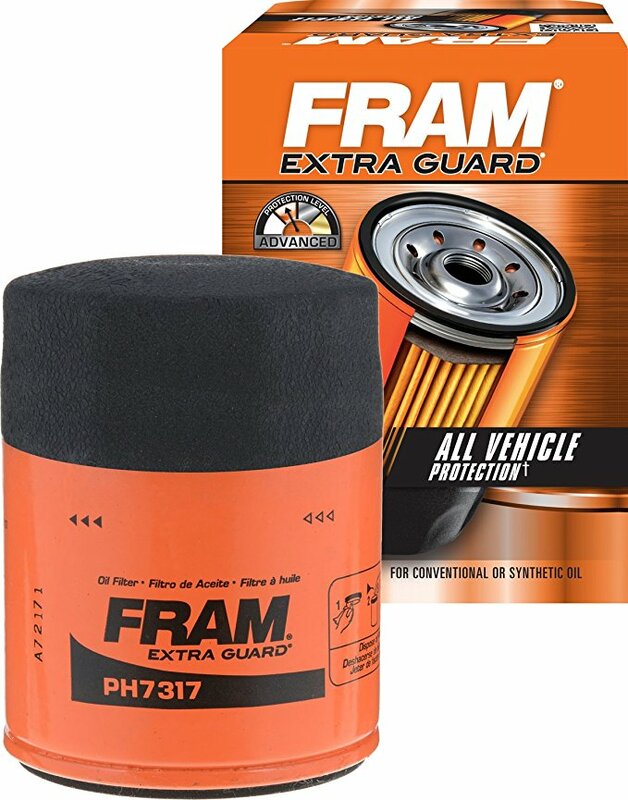 Fram’s Extra Guard filters come with a unique grip coating that makes it easier to install and remove the oil filter. The oil filter also has a precision coil spring inside. The relieve valve is reinforced Nylon with glass fiber. It may not be good as silicone, but it’s still quite reliable. This is certainly one of the better oil filters we have seen in this price range. It’s highly effective in trapping and holding dirt. It’s quite impressive that this filter has an internally lubricated sealing gasket. It makes removing the filter quite easy. You can rely on this oil filter for about 5,000 miles. While that’s not a long range, it’s well-suited for car owners who perform regular maintenance on their vehicles. The “tough guard” brand of oil filters from Fram come with good capabilities of withstanding extreme weather. Whether you are in the middle of a desert or a snowstorm, this oil filter would do its work. For drivers who like to change their oil every 6,000-10,000 miles, Tough Guard is optimized for stop and go traffic, towing, extreme weather conditions, and is engineered for use with premium conventional or synthetic oil. These filters are very reasonably-priced and offer excellent perks. This filter is excellent for low mileage cars. You can rely on it to keep the engine clean and running in any type of weather. Why we like it: This is an OEM factory-grade oil filter that comes with an unbeatable price. 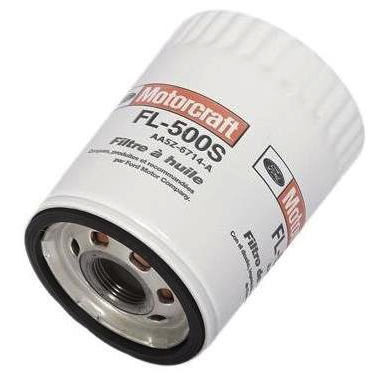 The Motorcraft FL500S oil filter is Ford-recommended for Ford, Mercury, and Lincoln vehicles. Though the brand is aftermarket, the oil filter is OEM-grade. We were surprised by the rather low price of these filters. We can say that this model is one of the least expensive OEM-grade oil filters money can buy. If you drive a non-Ford vehicle, it’s highly recommended to contact the car manufacturer to make sure this oil filter is compatible. Ford’s Motorcraft oil filters are designed similarly, and this one isn’t an exception. The oil filter has an ironed steel outer casing. The steel is well coated to resist rust, a common issue with steel in vehicles. The oil filter is designed to fit perfectly in Ford engines. The filter can remove contaminants such as dirt, dust, carbon, abrasives, sand, and other internal built-up. The filter medium comes with a high-efficiency rating. The star feature of Motorcraft oil filters is the pressure relief valve. It is well-designed to prevent backwash, where contaminated oil in the filter re-circulates back into the engine. No other brand does the valve better than Motorcraft. We were really happy with this purchase for many reasons. Mainly, the price was surprisingly cheap. Then, as always, the brand delivers on its promises. This oil filter is as effective as any OEM factory-grade product. It fits perfectly in Ford vehicles. The oil filter works exceptionally well, even in winter. It’s well-suited to use in both hot and cold weather conditions. One thing we were not so hyped about was the “high mileage” label the filter comes with. This is not a high mileage oil filter that can be used for over 6,000 miles. It works best for under 5,000 miles. We wouldn’t recommend using this oil filter for more than 6,000 miles. You should change this oil filter, even if you use synthetic oils. This is a rare OEM-grade aftermarket oil filter that comes with a price that can’t be beaten. We really loved the performance, especially the fact that the oil filter can withstand high heat conditions in the engine. It’s great to use with low-mileage Ford vehicles. Why we like it: This is a high-performance oil filter with a number of highly desirable features with an affordable price tag. The Bosch 3330 Premium oil filter is recommended for use with Castrol engine oil. It can be used with similar types of blends, of course, because the filter is not necessarily brand-dependent. This oil filter is usually recommended for gas engines. It’s suitable for medium-mileage vehicles that are regularly maintained by owners. This oil filter boasts some impressive features. It has a metal spiral-wound center tube, which increases the internal strength of the filter. It also makes the filter highly durable. The oil filter comes with end caps that can prevent trapped contaminants from reaching the engine. High-end oil filters have a valve to prevent contaminated oil from getting back into the engine. These end caps can do the same, but slightly less effectively. 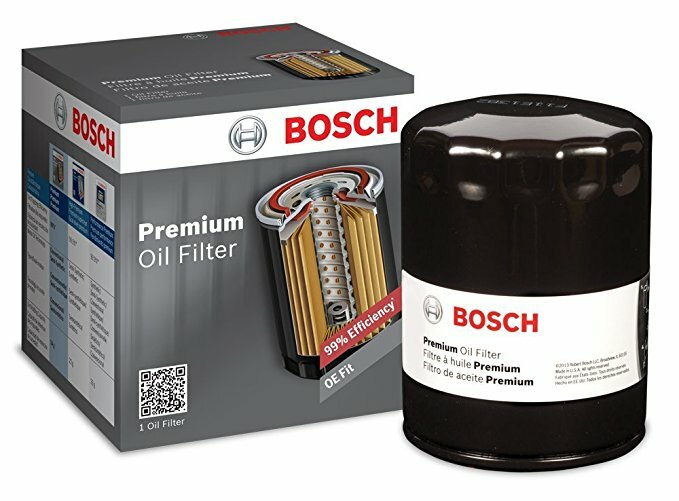 The Bosch oil filter is made with a media blend that is 99 percent effective in filtering out contaminants. Plus, the filter has an anti-drain back valve that prevents oil clogging inside the filter. This oil filter can prevent dry starts. It has a nitrile sealing gasket, which is internally lubricated so the filter never dries out. There’s a relief valve to prevent oil restriction and ensure proper flow. This is a highly reliable oil filter that car owners can count on to remove contaminants. 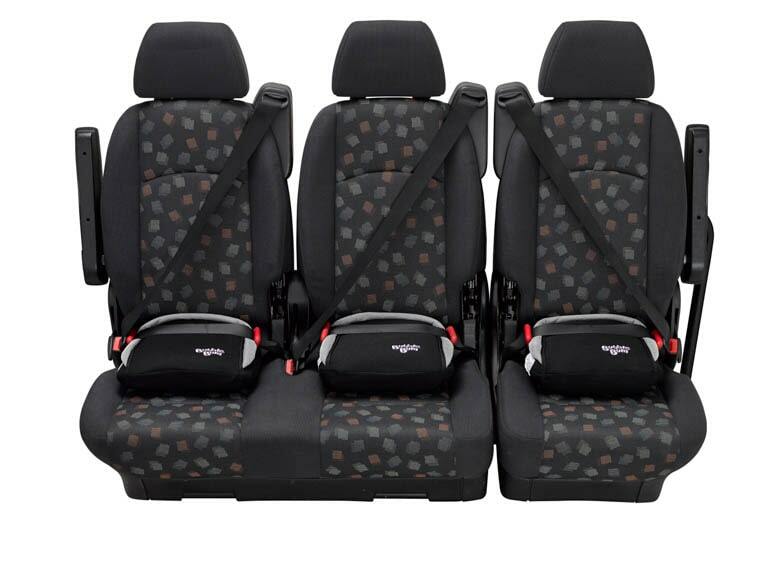 It offers excellent engine protection for select vehicles. The design of this oil filter prevents leakages and warping with extended use. The filter will keep oil that leaves the filter as clean as possible. The end caps and the anti-drain valve reduce the chance of contaminated oil flowing back into the engine. One big problem we found with this oil filter is that it’s a poor fit for some engines. Car owners should be very careful to make sure that this oil filter is an exact fit for their model. The oil filter is not auto-brand specific. It may fit some Toyotas, but not others, for example. Therefore, don’t buy without double checking the fit. This oil filter delivers maximum filtration efficiency. It’s well-priced and a great fit for recommended vehicles. We highly recommend this oil filter for suitable gas engines for long-term use. Why we like it: This Fram filter has one of the best flow rates as well as filtration efficiency levels on the market. It’s the best of both worlds. 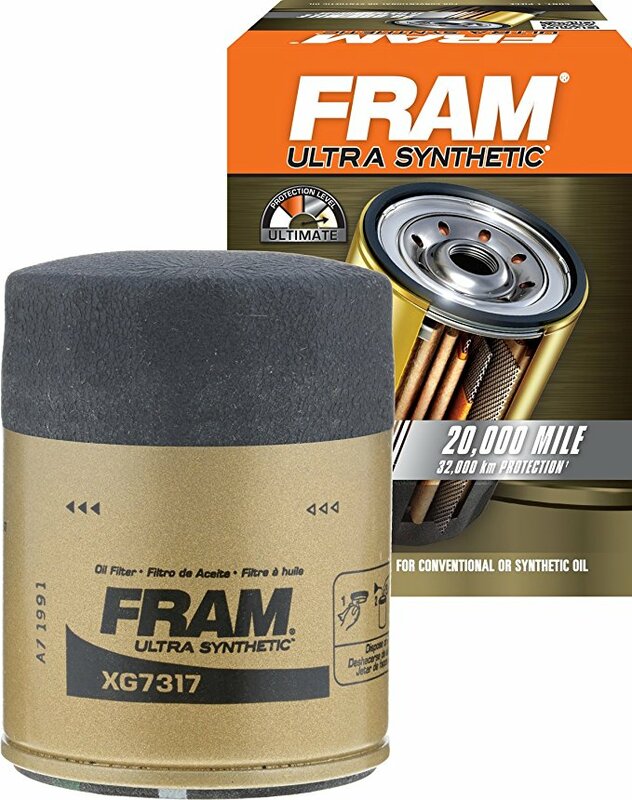 The FRAM XG7317 is considered one of the best synthetic oil filters all around. It’s made for use with synthetic oil, obviously, although some car owners report using it with conventional oil. We do not recommend this, however. This Fram filter is known for its long life and high-efficiency levels. We were also impressed by the price, which is very reasonable. For an OEM-quality aftermarket product, this oil filter truly impressed us. This Fram oil filter shares many of the features with other filters of the same brand. It comes with a silicone anti-drainback valve, which prevents back-drainage of contaminated oil into the engine. The valve is sturdily unlit to last. The oil filter has a metal screen with a filtration media that is completely synthetic. This make ensures uniform pleating inside. As a result, oil flow is highly optimal. This oil filter is one of the most durable on the market. It has been tested to last up to 20,000 miles. This is definitely one of the best oil filters for synthetic oil engines. This is a high-mileage oil filter that you can use for a very long time without requiring replacement. The application of the filter is notable. Thanks to the unique design, this oil filter ensures highly optimal flow rates. At the same time, it’s also highly efficient in filtering out contaminants. In fact, this oil filter boasts a 99.9% of filtration effectiveness at 20 macros. It’s hard to find an oil filter that can guarantee both high filtration rates as well as optimal oil flow. This Fram stands out in that regard. The oil filter is also very convenient to install. The exterior has an anti-slip grip, so installation is really easy. While the oil filter comes with a high-mileage rating, car owners may have to clean out the gunk every 5,000 to 10,000 miles. Some may not find that optimal. This filter works in cold weather conditions too. However, don’t expect to use it in extreme weather. Hands down, this is one of the best oil filters for use with synthetic oil. It has nearly zero downsides and the price isn’t so bad. 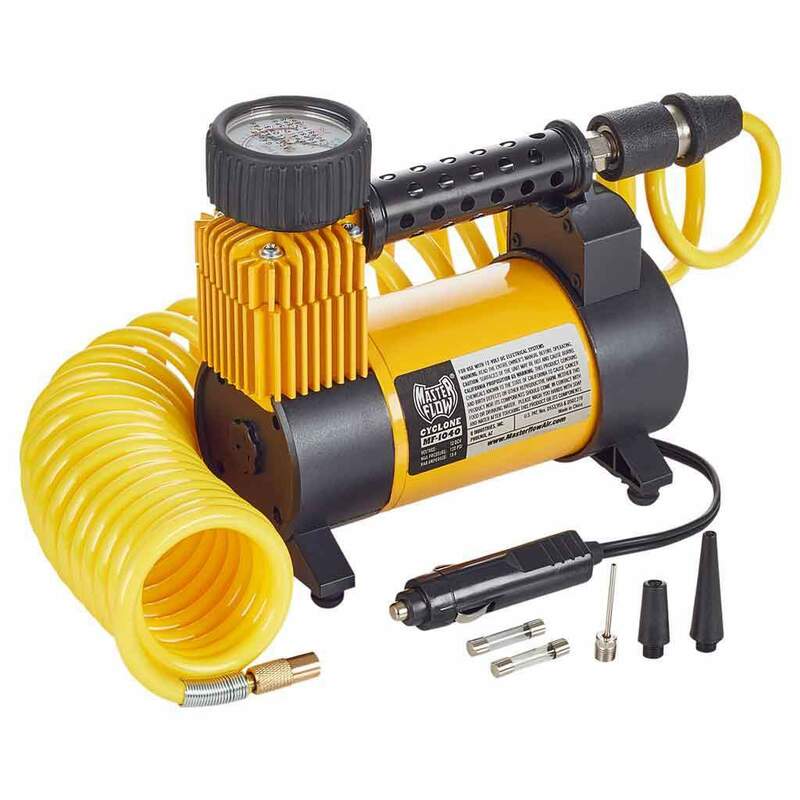 The filter is really exceptionally designed with high flow rates and high-efficiency levels. You can’t go wrong with this one. Why we like it: While it doesn’t boast any fancy features, this is one of the most pragmatic oil filters available in the market. 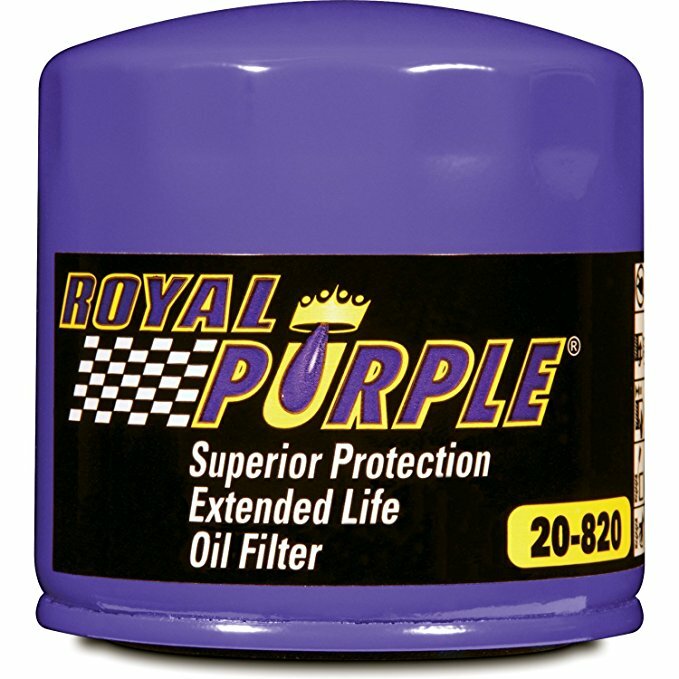 Royal Purple is a classic oil filter known for its superior performance. This oil filter offers a unique design that ensures high filtration levels. The Royal Purple oil filter has several strong suits in its design, unmatched by many other brands. For starters, it has a thicker case for superior strength. The shell is puncture-resistant to protect against debris on the road. The filter is sealed on both ends by metal end caps. The filter is sturdy overall, thanks to a center tube that prevents elements from collapsing. The media in the oil filter is 100 percent synthetic. It’s made from micro-glass that ensures high-efficiency filtering of contaminants. The filter has a bypass valve that makes sure no clogging occurs. Each filter has a heavy-gauge steel plate in the back, which offers higher burst strength to the filters. The internal gasket is made from a premium-grade rubber. The advantage is that the material offers good lubrication that makes installation and removal easy. The oil filter has a top-notch anti-drain back valve made from silicone. It prevents the oil going back into the engine when it’s not running. The silicone is highly durable and can withstand high heat conditions. The Royal Purple oil filter boasts an impressive 99 percent filtration efficiency at 25 microns. That’s one of the best available in the market. This oil filter is known to be long-lasting. It can perform even under tough conditions, thanks to the super sturdy design. This oil filter is definitely heavy, however. So it might not fit some compatible vehicles. Also, the oil flow is slow because of the thickness of the glass medium. Regardless of the minor cons, this oil filter performs superbly. We could install it easily and the filter worked as advertised. One drawback was that the filter is rather expensive. It is possibly the most expensive oil filter for a car in the market. This is a well-known oil filter that we highly recommend for compatible vehicles. The build of this oil filter definitely makes it stand out from the rest. If you can overlook the high price tag, this oil filter would be perfect. It’s not that difficult to choose the right oil filter for your car. However, you will have to be vigilant about the product specifications. This is the most important thing you need to do when shopping for a car oil filter. The oil filter must fit in your engine. When browsing for oil filters, you need to check the manufacturer’s compatibility chart. This is usually provided on the brand’s website. For example, the popular brand Fram has a cross-reference table on their website for buyers to match filters with their vehicles. We recommend consumers to check the oil filter with the make, model, year, and size of the engine of the car. Sometimes this information is not readily available. In that case, contact an auto mechanic or the filter manufacturer for direct confirmation about the compatibility. Do take the time to check compatibility of the filter because it’s best to be safe than sorry. There are actually many different types of oil filters. Mainly, oil filters are categorized based on the type of cars each fits, such as passenger cars, race cars, and so on. 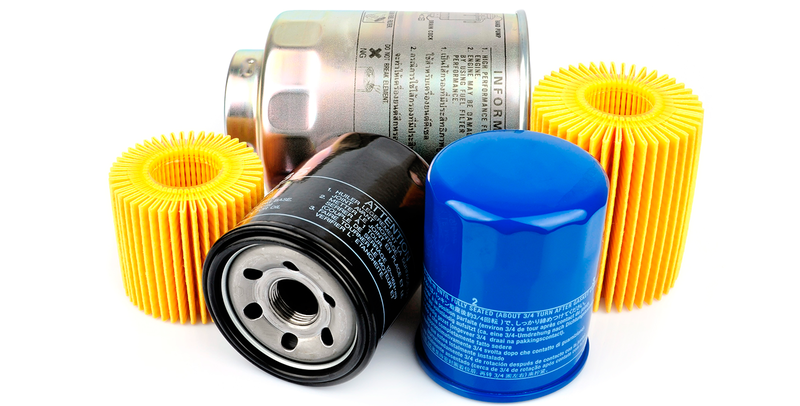 Oil filters cannot be used interchangeably with different types of vehicles. Primary oil filters are typically found as OEM parts. These oil filters can decontaminate all the motor oil in the engine. Also known as full flow filters, it’s absolutely essential for these oil filters to be highly efficient. Primary oil filters have to ideally be over 95 percent efficient. However, they have low flow restrictions. These filters also come with a valve to prevent the filter from becoming clogged. Secondary oil filters or bypass filters are installed in some cars in addition to the primary one. The secondary filter cleans out between one to 10 percent of the motor oil and reroutes it to the engine. Secondary oil filters work independently from the primary filter. The secondary oil filter mainly removes any extra contaminants in engines. These filters are not needed for most passenger vehicles. However, you can choose to install a secondary oil filter should your engine needs one. Conventional oil filters are a common type of secondary oil filter. Thee filters are made with cellulose membranes. Such filters are capable of filtering out tiny contaminant particles. These don’t last long and require frequent replacing. These oil filters remove contaminants by spinning rapidly. These devices are made mainly of two parts: a filtering membrane and a housing chamber. As a result, when replacing the oil filter, only the filtering media requires replacing, and not the housing chamber. Spinner oil filters may also be known as spin-on filters. The above review list has a few spin-on oil filters for cars you can consider. Magnetic oil filters are used to remove metal contaminants from engine oil. These filters do not need replacing, and only need to be cleaned according to a schedule. Magnetic oil filters do not remove non-metallic impurities like dust and are therefore not recommended for most passenger cars. This is a specialized type of oil filter designed to remove impurities from motor oil. These filters heat up to burn off contaminants in motor oil. It’s a way of refining the motor oil. Thermal chamber oil filters require a source of electricity to work. Also, these are known to reduce fuel efficiency in cars, and that’s why you don’t see any oil filters of this type reviewed up in the list. Car owners don’t need to fret about the type of oil filter as long as it fits inside the car. Cellulose filters are mostly found in disposable oil filters. This type of media can clean about 40 percent of engine oil, and hold particles up to 10 microns. Oil filters with cellulose are only suitable for short-term use as they require replacing at least every 3,000 miles. Synthetic filter media indicates a high-quality oil filter. This media can clean 50 percent or more motor oil. Each comes with a capacity of up to 40 microns, which is really good. These filters can last between 5,000 to 7,000 miles. This filter media is found in high-end oil filters that are suited for high mileage use. Microglass is a very fine metal medium. It is about ten times finer than cellulose. Microglass is also nonrestrictive inside the filters, so they are suitable for use in cold weather. These filters are long-lasting and only need replacing about every 2 to 5 years. When comparing different oil filters, check the type of filter medium. It can indicate whether you are buying a high-end or a cheap oil filter for cars. High-end oil filters come with anti-drain valves that prevent contaminated oil from filtering back into the engine. This is a concern when the engine is shut down. If any contaminated oil remains in the filter, it can get back into the engine when it’s not working. Therefore, when buying an oil filter, make sure there’s protection against this type of “backwash.” All the products reviewed on the list have protection against contaminated oil recirculation. Do you drive in hot or cold weather conditions typically? The weather should be a concern when buying an oil filter. Particularly, cold weather. A restrictive oil filter with very small holes can easily get clogged in cold weather. In low-temperature conditions, motor oil naturally thickens. Therefore, you will need a low-flow rate oil filter suitable for cold weather if you are planning on driving in primarily low-temperature conditions.